Major retail and commercial bank in the UK National Westminster Bank, commonly known as NatWest, advertises the various ways it brings its services to people in a new TV spot, released with the tagline “Bringing the bank to you”. 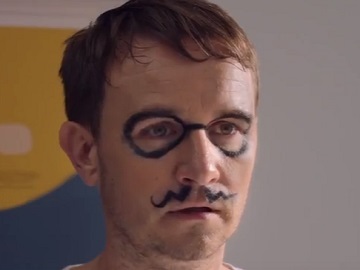 The advert opens with Paul, a father washing his face in the morning and discovering that the drawing made around his eyes and mouth – round-shaped eyeglasses and a curly mustache – doesn’t go away. He needs to go to the bank, but imagining how his going there might be, with passersby laughing at him and even snapping photos of him, he thinks today night not be the best day. NatWest thought about the situations when customers can’t go personally to a branch, so it came up with various way of coming to its customers, from having an officer meeting them in a specific place, such as a coffee shop, to setting up a mobile branch to 24/7 messaging through its mobile app. Given the nature of his situation, Paul opts for the last alternative, which proves to be just what he needed. The spot ends with the voiceover saying NatWest are “always thinking of new ways to bring the bank to you” and adding the bank’s tagline, “We are what we do”. NatWest’s mobile app, which was voted “Best Bank App” in British Bank Awards 2018, gives users all the tools they need to manage their money on the go, according to the bank, which informs that the app is secure, easy to use and convenient. With Android fingerprint login, touch ID & iPhone X FaceID, the app also allows users to check their balance, view their transaction detail, personalise their accounts with nicknames, manage account alerts, pay bills, friends or someone up to £250, make future dated payments, register their travel plans, and more.